Clematis 'Jackmanii' is the traditional cottage garden Clematis, known for its immense crop of purple flowers from July to September. The large single flowers have a velvety texture and typically 4, 5 or 6 petals. 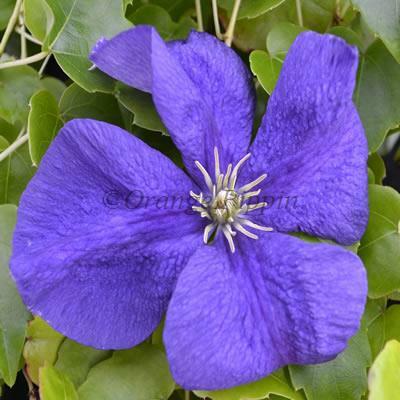 Clematis 'Jackmanii' was raised by George Jackman and Son, England, in the 1850s. 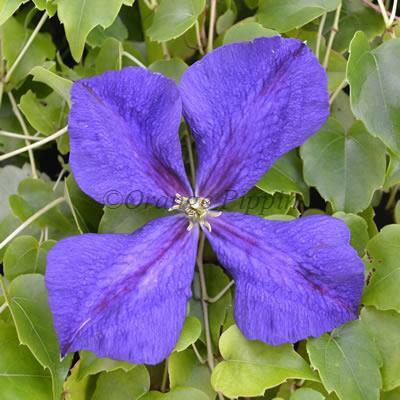 It was one of the first successful attempts to breed a new hybrid clematis variety. This fast growing, non-evergreen climber is best grown against a trellis or a strong fence or wall as it requires maximum support until established. It can be grown in any aspect, and does best in full sun with its roots in shade. As with most late-summer flowering clematis, it benefits from hard-pruning in January - cut it back to 40cm or so.